The early days of November brought our first snow, which wasn’t a dusting but a deluge. We had to cancel the Sharing the Dharma Day scheduled for the first Sunday, although six people made it up here the day before for Offering Service Saturday. Ven. Samten and Ven. Tsultrim are enjoying teaching the other residents how to use the tractor as a snow plow. This is the third year in which Ven. Chodron has taught from Buddhism: One Teacher, Many Traditions, the book she co-authored with H.H. the Dalai Lama. Having completed the first two-thirds of the book in the two previous years (watch the videos of Year 1 here, and Year 2 here), we focused on the last third of the book covering the four immeasurables, bodhicitta, the bodhisattva perfections, and buddha nature. Learning about these topics from both the Pali and Sanskrit traditions was especially stimulating, and we were able to delve deeply into them with two teachings daily, plus three meditation sessions and discussion groups. You can watch the teachings here. 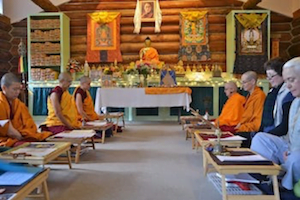 Om mani padme hum resonated throughout the Abbey over Thanksgiving weekend as we engaged in the heart-opening practice of nyung-ne—a two-day retreat focused on the Buddha of Compassion. The practice combined meditation on Thousand-Arm Chenrezig and recitation of his mantras, along with prostrations, fasting and silence. Nyung-ne is not only strong purification, but it also turns our mind to refuge in the Three Jewels in a powerful way because all our usual distractions are cut off. Ven. Chodron, accompanied by Ven. Damcho, began her Asia tour in Taiwan this year. Staying at Pu Yi Nunnery, which hospitably hosted them last year, Ven. Chodron gave a talk on bodhicitta to the sangha there, and had a warm sharing of thoughts with the Pu Yi abbess and the vice-abbess. The next day, they visited Nong Chan Monastery, where Ven. 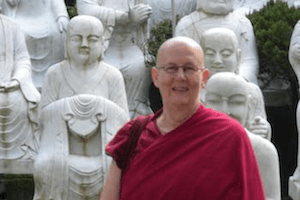 Chodron was interviewed by a representative of Dharma Drum Mountain’s publication “Humanity Magazine.” The nuns toured the monastery and had a wonderful discussion with the abbess and nuns from the magazine. 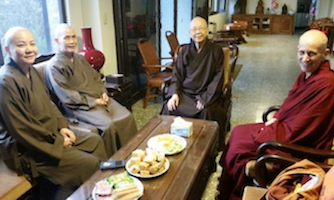 On the third day, they visited Fa Kuang Buddhist Institute, accompanied by Ven. Heng Ching, a Chinese bhikshuni who is a long time friend of the Abbey and who has also been instrumental in supporting the Institute in its early years. They enjoyed lunch with a Tibetan geshe and a Chinese professor, as well as with the Institute’s librarian—it was a great meeting of diverse people who share a common faith in the Three Jewels and a wish to spread the Dharma. Day four took them to Fo Guang University where Ven. Chodron gave a talk on “Tibetan Buddhism East and West” to a packed room. The nuns also enjoyed lunch with some of the professors and tea with some of the English-speaking students. Ven. Damcho has kindly acted as translator into Mandarin for all of these talks. The fifth day they met with Venerable Master Wu Yin, who was very pleased to see the six Vinaya books the Abbey recently published, and are now staying at Luminary Mountain Temple, where Ven. Damcho and Ven. Jenkir are working together to prepare handouts for the upcoming Living Vinaya in the West program that will be held at the Abbey in January-February 2018. As always, it is very invigorating and inspiring for us to visit and to work with our Asian bhiksuni sisters. We are indeed a worldwide sangha. More news of their travels in Taiwan, followed by their visit to Malaysia and Singapore, will come in the next enews. Below are links to Ven. Chodron’s teachings and talks in Asia. We’ve decided to change the name from Prajna House to Prajna Cottage because “house” implies something large, while this cozy living space is more like a cottage. 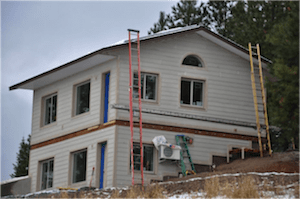 Conditions necessitated changing plans for the exterior of the building from stucco to hardiplank. Despite the rain and snow, Eric and Brandon (our contractor and his worker) had the hardiplank up before mid-November. Work is progressing on the inside of the building too, with the sheetrock installed, the texture sprayed on the walls, and the interior painting completed. The cabinetry in the kitchenette and bathrooms was installed, and we found some nice furniture on Craig’s List. You can watch a new video here and see more pictures of Prajna Cottage here. 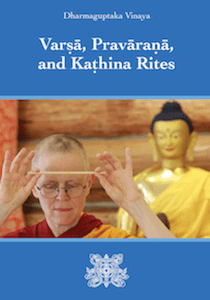 The Abbey is pleased to have published English translations of the principal monastic rites of the Dharmaguptaka Vinaya, including the sramanera/i ordination rite, posadha (Tib. sojong), the rites to enter and conclude the rainy season retreat, the rite to establish the territory (sima), and training booklets for sramaneras/is and siksamanas. 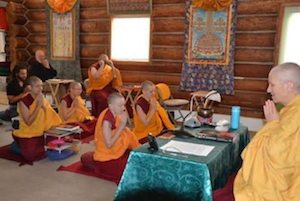 Having these rites available in English is a big step forward in establishing the sangha in the West. Ven. Chodron discusses the booklets here and reads an inspiring passage from the posadha ceremony here. Click here to order hard and soft copies of the booklets. Ven. 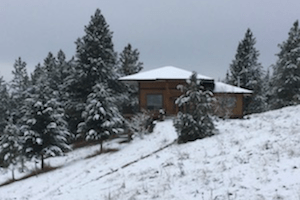 Jigme, who was a nurse practitioner and therapist before ordaining, was invited to talk to the staff and volunteers of Hospice of North Idaho about Buddhist views on death and dying and how to support a Buddhist through the death process. She gave a general overview of the Buddhist worldview to about forty hospice workers. Since most in the room were Christian, she highlighted shared values and then discussed how Buddhists bring meditation on death into their practice. She also stressed the importance of avoiding the eight worldly concerns and developing love, compassion, ethical conduct and wisdom in our lives. As hospice workers, they already knew that people die the way they live. She described the difference between the brain and the mind, the many levels of consciousness from very coarse to very subtle, and the ability of accomplished meditators to access the subtle levels of consciousness and use them to realize the nature of reality. She discussed the Buddhist description of the process of dying, the visions that occur, and the importance of having a calm environment. It’s important to ask Buddhists in hospice about their practice and how they want to be supported at death time. In that light, she encouraged writing spiritual advance directives so others will know the type of spiritual support we want. Many people asked questions about Buddhist belief in a soul, God, and heaven and hell. Although there were many in the room who were new to Buddhism, everyone was very interested in how they could help a Buddhist practitioner through the death process so that death was as comfortable and respectful as possible. 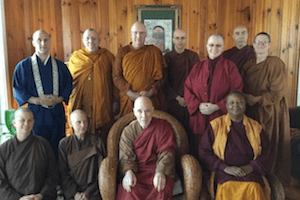 In mid-October, 11 monastics from Theravada, Zen, Chan and Tibetan Buddhist traditions met in North Carolina for the 23rd annual Western Buddhist Monastic Gathering. During the five-day event, participants learned about each other’s teachings and practices and discussed topics of common interest. Ven. Yeshe was one of the organizers this year. The group focused on topics of current relevance to monastics, including inter-religious dialogue and social engagement. The next gathering will take place in October 2018 at Spirit Rock Meditation Center in California. We appreciate all the gifts and donations that everyone sends us, but sometimes we don’t know who sent them and so we can’t thank you properly. When you order a gift from a company online, they are often delivered to us without the donor’s name on or inside the box. If you send a gift in this way, please write to us at mailto:gifts.sravasti@gmail.com and let us know so we can thank you properly. We also dedicate for all donors at our Lama Chopa pujas twice a month, and we need your name for that too! We welcome Ven. Jampa back to the Abbey. She had been in Germany for a few months. September, October, and part of November, several long-term guests—most in their twenties, one in his thirties—stayed with us. 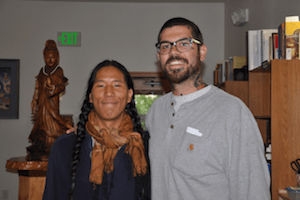 We enjoyed the opportunity to get to know Toji and Ryan (pictured on right), Jazz, Karen, and Matt as they explored the Dharma and learned how to use the Buddha’s teachings to help them in their lives. All of them took refuge and precepts, and we could see the inner growth happening in them as they learned thought training, non-violent communication, and cooperation during the various offering service jobs. Al, who is imprisoned in North Carolina, wrote a poem about cultivating equanimity. And for all of us who try to meditate when noise interrupts our focus, Al talks about how he meditates in prison, where the noise is much greater. Luis, who first came to the Abbey as a child and is now a young adult, shares his thoughts on love. He’s written several poems and essays in his search to understand love, and we’ll post one each month for the next few months. A new section has been added to Ven. Chodron’s web page containing a collection of commentaries on essential Buddhists texts, and the history of teachings on them, by Ven. 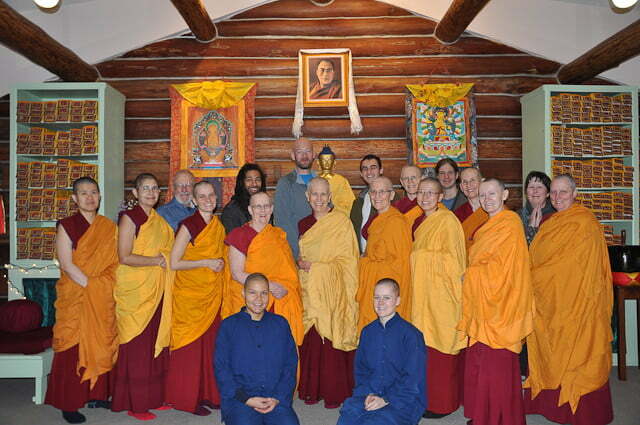 Chodron and guest teachers at Sravasti Abbey. Click here to access them. Ven. Semkye is teaching this weekend in Carbondale, Colorado and leading a retreat on the six paramitas. Click here for information and registration. If you are shopping for holiday gifts on Amazon, Amazon will donate 0.5% of the price of your eligible purchases to the Abbey. You can get what you need and help the Abbey at the same time!